TOKYO: Opposition groups yesterday vowed to challenge laws passed overnight that clear Japanese troops to fight abroad for the first time since World War II, saying the changes are a “black stain” on the country’s history. Japan’s ruling coalition, led by nationalist Prime Minister Shinzo Abe, pushed the laws through in the early hours of the morning after days of tortuous debate that at points descended into physical scuffles in parliament. For the first time in 70 years, the new laws will give the government the power to send the military into overseas conflicts to defend allies, even if Japan itself is not under attack. The nationalist premier argues the laws are necessary to protect against threats from an increasingly belligerent China and unstable North Korea, but opponents fear the vague wording could see Japan dragged into far-flung foreign wars. Abe has faced bitter opposition over the changes, which have seen his popularity slump, and opposition lawmakers have vowed to do everything in their power to fight them. “This is not an end,” said Renho, a senior lawmaker from the main opposition Democratic Party of Japan, who goes by one name. Speaking after the vote, Abe said the changes were “necessary in order to protect people’s lives and peaceful way of life”. “This is designed to prevent wars,” he told journalists. 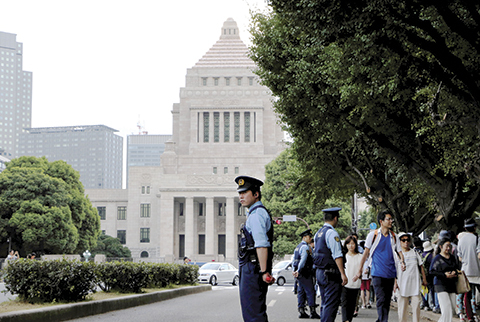 Abe had been unable to muster support to amend the pacifist constitution and instead opted to “re-interpret” the meaning of self-defense in order to push through the new laws, but the move has sparked a groundswell of opposition not seen for decades in Japan. A hard-core group of some 300 protesters gathered outside parliament yesterday, calling for the legislation to be abolished and vowing never to stop their fight against Abe. “Our battle will never end. This is just the beginning,” Keisuke Yamamoto, an organizer from one of the citizen groups that have been leading weeks of rallies, told AFP. “We will resort to every possible measure, including bringing the case to the courts… We can’t let this movement fizzle out now.” Behind him, demonstrators carried banners or billboards, which read: “We should not get children killed,” and “Don’t let them wage a war”. Legal scholars have argued the legislation violate Japan’s pacifist constitution, imposed by the US after World War II, and several groups on Saturday said they were preparing to challenge the new laws. Susumu Murakoshi, chairman of the 36,000-strong national bar association, yesterday criticized the government for going against the will of the people and pledged to see the changes abolished. The laws have “left a black stain on the history of Japan as a constitutional democracy,” he said in a statement. National broadcaster NHK reported that respected constitutional scholar Setsu Kobayashi, from Keio University, is already planning to muster 1,000 lawyers to file a challenge to the legislation in the Tokyo district court. Legal action aside, the laws will likely take months to come into effect and the supreme court could urge lawmakers to amend them. Even under the new legislation, Japan’s military will still be more restricted than other countries: parliament will have to approve any deployments, based on strict criteria, and force must be kept to a minimum. Tokyo has said the changes would allow troops to help their American counterparts, but officials have remained tight-lipped on who else it would cover. It could include Australia, which Japan has forged closer military ties with in recent years, and the new laws were welcomed by the country’s Foreign Minister Julie Bishop.